In AD 79, late in the year, two cities – Herculaneum and Pompeii – along with various small towns, villages, and farms in the south of Italy were wiped out in just 24 hours by the catastrophic eruption of the nearby Mount Vesuvius. This event ended the life of the cities, but preserved them to be rediscovered by archaeologists nearly 1,700 years later. These were not extraordinary cities; they died in an extraordinary way, but they were ordinary ancient Roman cities, and because of this they have been able to become a lens through which we can see and understand a whole civilisation. 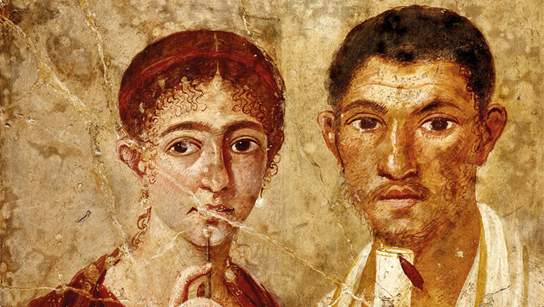 Through objects from the British Museum collection and an immensely generous loan of 250 objects from Naples, Pompeii and Herculaneum – many of which have never been seen outside Italy – the exhibition will focus on the daily lives of the ordinary people who lived there. Through some of the most famous objects to have emerged from the two cities, and finds unearthed during recent archaeological work there, the exhibition will look at the make-up and activity of homes – and the people who lived in them – at both Pompeii and Herculaneum. Often the stories revealed are surprising. For example, from Pompeii, the large industrial centre of the region with a population of around 12-15,000, comes a statue of a woman commemorating her funding – with her own money – of the largest building in the forum, the heart of the city. This, in a male-dominated society where women might not usually be known as the rich patrons of civic monuments. While at the same time, the more mundane elements of life are revealed in objects such as an extraordinarily well-preserved loaf of bread that, in Paul’s words, ‘went in the oven in AD 79 and came out in the 1930s’. But of course the reason we know this story and can see these wonderful objects is because of the tragedy which struck in AD 79. Incredible finds from Herculaneum, a smaller seaside town of some 4-5,000 inhabitants, include food, leather, and wooden furniture – from a table to a baby’s cot – and survive only because they were carbonised (turned into charcoal) by the 4-500 degree Celsius volcanic avalanche that engulfed the city.